The elaborate Bling Pong Pendant is a diamond-encrusted table tennis bat. Representing a table tennis ball, a single 0.10 carat diamond sits on the bat. The larger diamond is separated by a raised ring from a further 113 smaller diamonds that cover the table tennis bat surface. 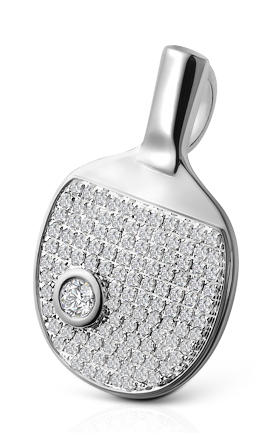 The Bling Pong Pendant is available in either 925 silver or 18k white gold.